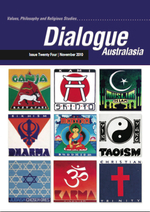 This e-newsletter will arrive at one of the busiest times of the year...but I wanted to let you know that the 24th issue of Dialogue Australasia journal should reach you any day, and that registration is now open for the 2011 Conference (in the event you had some $$ left in this year's budget to spend!) And once all the marking and reports are done, you might find one of two other bits of interest herein. Dr David Tacey – Reader in Literature & Associate Professor of Psychoanalytic Studies, La Trobe University. If you do not receive your journals by the end of November, or realise your Membership has lapsed and wish to obtain this copy of the journal, please contact the DAN EO. The good folks at Scarboro Missions have added to their suite of Golden Rule resources a comprehensive curriculum called A Rule Made of Gold. And it is now much easier to order the Golden Rule Poster (email B B Broughton Ltd who are offering a discount of 20% for 50+ posters). 'There's difference between being obsessed and motivated,' Mark assures his girlfriend. What is Mark most passionate about? How much is he prepared to sacrifice in pursuit of his goals? How are the themes of 'coolness' and money played out through the film? Facebook has around 500 million members worldwide. What impact has it had on our culture? 'Who are you? . . . I mean, what do you do?' Mark asked junior lawyer Marylin Delpy. In what ways does Facebook encourage us to define ourselves? How does this affect our concept of identity? 'As if every thought that tumbles through your head was so clever it would be a crime for it not to be shared,' Mark's ex Erica snaps at Mark. Why are people drawn to the idea of broadcasting their personal lives on the internet? 'The internet's not written in pencil, Mark. It's written in ink,' states Erica, seething at the comments he blogged about her. Why is the typed word so powerful? Why is it tempting to misuse this power online? What positive things can social-networking sites achieve when used to their full potential? '[Mark's] from a logged-in, left-out generation that knows little of beauty and even less of feeling,' says Empire. Do you agree, and why/why not? How might this generation resolve these problems and learn to connect with people on a deeper level? The Institute for the Study of Christianity in an Age of Science and Technology (ISCAST) is an Australian organisation dedicated to exploring the interface between science and the Christian faith. Prof Gareth Jones 2010 ICAST Lecture on Who Says? The Use and Misuse of the Bible in an Age of Science and Technology Prof Jones will be presenting a keynote at the 2011 DAN Conference. God in the White House: From Washington to Obama - the presidents' religious beliefs and their impact on politics. What is a portrait and can it reveal the essence of a person's character? Cynthia Freeland explores these questions. Analytic Philosophy - Gottlob Frege was one of the founders of the movement known as analytic philosophy. Michael Dummett explains why Frege was so important for philosophy. Moral Philosophy - what is it and when do we have it? Gideon Rosen considers these questions. 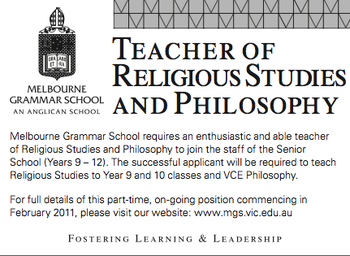 Capitalise on current public debate over SRE in public schools in NSW to start a conversation with colleagues and your wider community about the importance of providing opportunities for students to study all religious and secular worldviews in a critical and academically rigorous manner. For a snapshot of recent opinion, check out Special Religious Education: The Good, The Bad and The Ugly by Catherine Byrne....and the subsequent feedback comments. Challenging the Chaplains - Compass investigates support and opposition to the growing number of chaplains in our state schools. Yulki: Arnham Land Priest - the remarkable story of Yulki Nunggumajbarr, the first traditional aboriginal woman to become a priest. The Secular Dharma - Buddhist practitioners in the West will often say that Buddhism is not a religion as such. 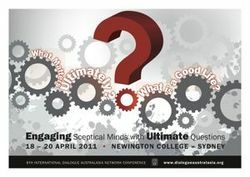 So what role do philosophy, belief and the Big Questions have in the practices of compassion, meditation and awareness? Gary Gach will also weigh into these issues during his keynote at the 2011 DAN Conference. On the 250th anniversary of his death, learn more about The Baal Shem Tov: A mystic, healer and radical Jew (1698-1760). And as debate continues over the proposed Voluntary Euthanasia bill, read a Jewish perspective on Health and Wholeness. Once exam marking and reports are over, you might do yourself a favour and settle down with this article from Rowan Williams on Faith, Hope and Charity in the world today.